On the journey of spiritual self-discovery, us explorers are often driven by the search for that great mystical experience that will enlighten us…or at the very least, give us an answer, ANY answer to whatever it is we are questioning about life. Whether it is in the solitude of a cave in the mountains, a vision quest in the forest, a pilgrimage to a sacred site, sitting at home on your own meditation cushion, or even standing in the Produce department of the grocery store…sometimes we are waiting for that one big A-HA moment that makes it all seem clear (whatever “IT” is…). I have to admit that part of me was kind of hoping for that here in India – maybe I would have a big “samadhi” moment and I would be transformed from one who doesn’t get it to ONE WHO DOES GET IT. 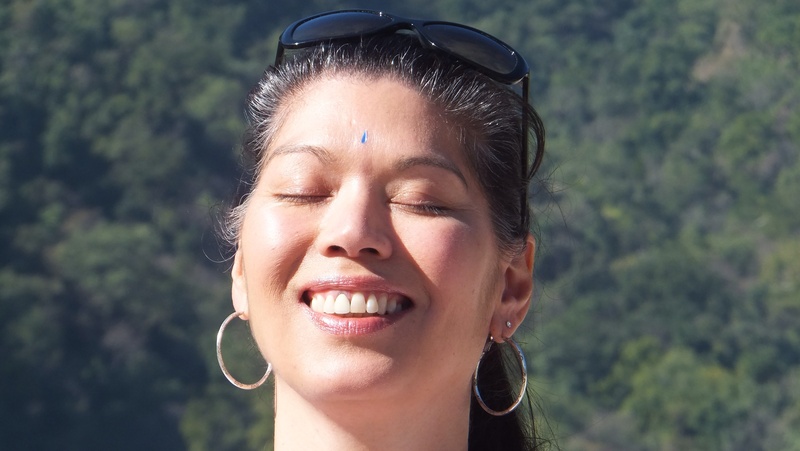 Here in India, we are learning breathing techniques and meditative practices that all assist in cleansing our bodies and clearing our minds in order to create the conditions for insights to occur. Because we are immersed in the practice daily, there are many opportunities for clarity and there have already been a lot of “lightbulb” moments where we are starting to figure things out. But the big revelation for me came after a series of Kundalini classes. As we progressed through the chakras, an electric feeling moved up my spine and as the energy grew stronger I reached a crossroads point. I could resist or I could surrender…and I chose surrender. For me this was THE pivotal moment because I took a breath, relinquished all control, relaxed my forehead (I can still hear my teacher, Vishva-ji, telling me to soften), and gave myself over to the experience. I made the decision – this was so empowering! How many times in my life when faced with challenges have I held back, doubting myself, questioning, digging my heels in wanting things to be different? How many times have I fought acceptance and preferred to live in denial? How could I have thought this was freedom, when in fact I was still stuck in my own perceptions of what was right? Surrender doesn’t mean giving up…it means giving over to what is. In that moment during my yoga class, I did not feel fear, I did not worry, I did not cling, and I didn’t even try to hang on to any blissful feeling. Without any attachment or aversion, in that moment I truly was just ME, completely free. It is very difficult in words to explain this…it was the most free I have ever felt. What happened next was actually insignificant (even though it was the most incredible electric feeling that ran all the way up my spine, into my arms and legs, and up the back of my head to my ears) compared to my moment of choosing to let go. The great mystical experience turned out to not be the end result after all (i.e. the full body sensations of electricity), but rather it was precisely the moment before, when I chose SURRENDER. In the days since, I have felt clarity like I’ve never felt. I have felt compassion, and unity and an even deeper love for my friends and family whom I miss so much. I have felt so happy, like a weight has been lifted. Turns out that I am not one who does not get it after all… I am one who feels IT. IT is connection, IT is love, IT is God…I am trying to practice this surrender in all moments and I have to say, it is a wonderful way to live.